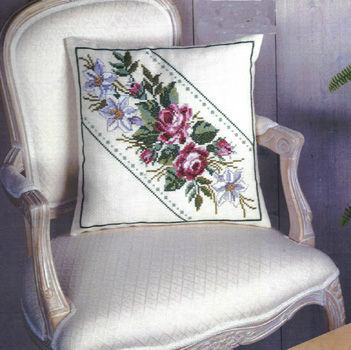 A lovely cushion with sprays of flowers and a simple border. The large scale chart and key is printed on an A3 sheet. 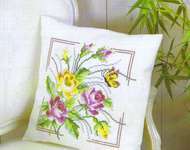 The pattern is worked in whole cross stitch and backstitch in 14 shades of pearl cotton. The stitch count is 110 by 110. Stitched on one half of the fabric with the remainder as backing. A large scale chart, needle and instructions in 10 languages. See also the matching Table Runner with Roses and Lilies.